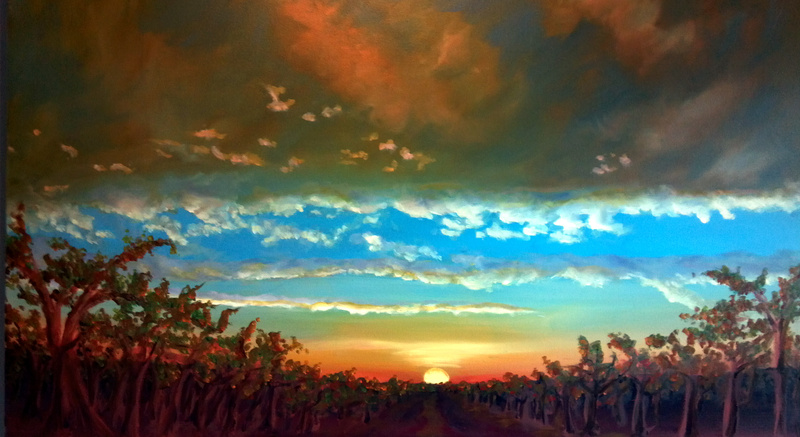 Sunset Vineyard - 36" x 60"
Moving to Northern California in 1972 Jennifer Cabaud began to look for a school that would give her the skills she was wanting. The Academy of Art in San Francisco was the combination of fine art and commercial art that she was looking for. After having her own advertising/graphics business in the late 70's she began to paint in different mediums. She studied with Ray Jacobsen for his unique style of watercolor and won the Sonoma Vintage Festival Poster Contest in 1996 with one of their best selling posters to date. Because of it's whimsical bear cub theme, the festival committee produced children's t-shirts for the first time and sold out on the first day! In recent years she has been studying with Brooks Anderson, and working in oil painting. Her intense love of color is evident in these brilliant and expressive paintings. Concentrating on the beautiful surroundings of her home in Sonoma, she specializes in a unique view of the ever changing vineyard land that is the heart of Sonoma Valley.